Vignette on map of Westmorland. Buildings and tower with flag. Building with two towers, symbol for a castle. Print, engraving, Brough Castle, Westmorland, by Thomas Allom, engraved by W le Petit, 1833. Originally in vol.2 no.12 in Westmorland, Cumberland, Durham and Northumberland Ilustrated, with descriptions by Thomas Rose, published by H Fisher, R Fisher, and P Jackson, Newgate, London, about 1835. Drawn by Thomas Allom, engraved by W le Petit, 1833. Print, engraving, Brough Church, St Michael's Church, Brough, Westmorland, drawn by Moses Griffith, engraved by Comte, published by Edward Harding, 98 Pall Mall, London, 1801. Tipped in opposite p.137 of A Tour from Downing to Alston Moor, 1773, by Thomas Pennant. Brough Castle in the background. Moses Griffith. Del / Comte Sc / BROUGH CHURCH / Pub June 7 1801 by Edw Harding 98 Pall Mall. Print, uncoloured engraving, Brough Castle, Westmorland, drawn by W Westall, engraved by E Finden, about 1830s? This engraving is used as a vignette on Bell's map of the county, 1833. Drawn by W. Westall, A.R.A. / E. Finden sculp. 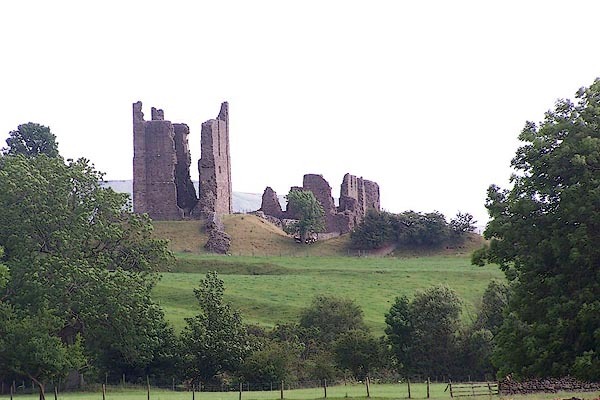 / BROUGH CASTLE, / WESTMORELAND. Print, uncoloured engraving, Brough Castle, Westmorland, engraved by Sparrow, published by Samuel Hooper, 1775. Print, uncoloured engraving, Brough Castle, Westmoreland, engraved by Sparrow, published by Samuel Hooper, 1775. Print, uncoloured engraving, Brough Castle, Westmorland, published early 19th century? Scrapbook, 4 volumes, of descriptive texts, maps, and prints of views and coats of arms, for Westmorland and Cumberland, assembled by a member of the Lowther Family, late 18th early 19th century. THE above Inscription manifestly proves that the repairs done by the Countess were chiefly internal, and that the ruins now seen are those of the original building: but by whom or when they were built, neither Leland, Camden, or any other of the Topographical Writers (at least those in print), mention; tho', as has been above observed, the similarity of its Keep to those of Dover, Bamborough, Rochester, the Tower of London, and many others, plainly evince it was constructed on the Norman model. THE present proprietor of these ruins is the Earl of Thanet. Of late years they have been much demolished for the sake of the materials, which have been used in building stables, garden walls, and other conveniences; and particularly about the year 1763, a great part of the north-east round tower was pulled down to repair Brough Mill, at which time the Mason therein employed, for the sake of the lead and iron with which it was fixed, displaced the stone which the Countess of Pembroke caused to be set over the gateway, on which was the inscription before cited. CAMDEN describing this country says, 'Here Eden seems to stop its course, that it may receive some rivulets; upon one of which, scarce two miles from Eden itself, stood Verterae, an ancient town mentioned by Antoninus and the Notitia; from the latter of which we learn, that in the decline of the Roman empire a Praefect of the Romans quartered there with a band of the Directores. The town itself is dwindled into a village, which is defended with a small fort, and its name is now Burgh; for it is called Burgh under Stanmore, i. e. a Brough under a Stony Mountain. It is divided into two. The Upper, otherwise Church-Brough, where the Church standeth, of which Robert Eglesfield, Founder of Queen College in Oxford, was Rector, and procured the appropriation thereof from King Edward III. to the said College.' - And again: 'And near the Bridge is a Spaw-well, which hath not long been discovered. The other village is called Lower Brough, from its situation; and Market Brough from a market held there every Thursday. In the time of the latter Emperors (to observe this once for all) the Little Castles, which were built for the emergent occasions of war, and stored with provisions, began to be called Burgi; a new name, which, after the translation of the Empire into the East, the Germans and others seem to have taken from the Greek [ ]. And hence the Burgundians have their name from inhabiting the Burgi; for so that Age called the dwellings planted at a little distance from one another along the frontiers. I have read no more concerning this place, but that in the beginning of the Norman Government, the English formed a conspiracy here against William the Conqueror. I dare be positive that this Burgh was the Old Verterae; both because the distance, on one side from the Levatrae, and the other from Brovonacum, if resolved into Italian miles, exactly agrees with the number assigned by Antoninus; and also, because a Roman military road, still visible by its high ridge, runs this way to Brovonacum by Aballaba, mentioned in the Notitia; the name whereof is to this day kept so entire, that it plainly shews it to be the same, and leaves no ground for dispute; for instead of Aballaba we call it at this day by contraction Appleby. ANNO 1774, William King of Scotland taking advantage of the absence of King Henry, then in France, quelling a rebellion excited by his sons, invaded England at the head of an army, chiefly composed of Flemmings, and took this Castle, together with those of Appleby and Prudehow; but four hundred horsemen being assembled by Robert de Stouteville, Ralph Granville, William Vesey, Barnard Balliol, and Odenotte de Humfreville, they came up with the Scots, who were retiring from the seige of Alnwick; and finding them dispersed over the country in search of plunder, whereby they had left the King slightly guarded, they attacked, and with very little bloodshed on either side made him prisoner. This View was drawn Anno 1774.
hearsay A stone castle was built here, on the northern part of the roman fort, Verteris, in 1095 for William Rufus. It was destroyed by invading Scots, 1174. 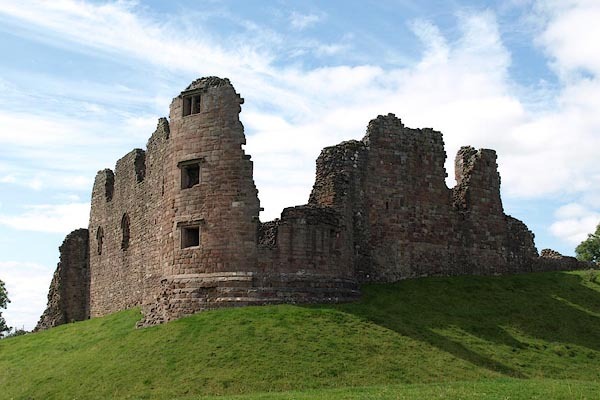 ... and afterwards the castle was rebuilt with a new keep, called the Roman Tower. Sir Hugh de Morville strengthenned the castle in the 12th century. The castle went to Roger de Vipont in 1204. Clifford Family became owners in 1268. It is thought that Robert Clifford built the round tower about 1300. Roger Clifford, his grandson, built the hall about the 1350s. This was destroyed by a fire set by the Scots, 1521, and the castle became derelict.